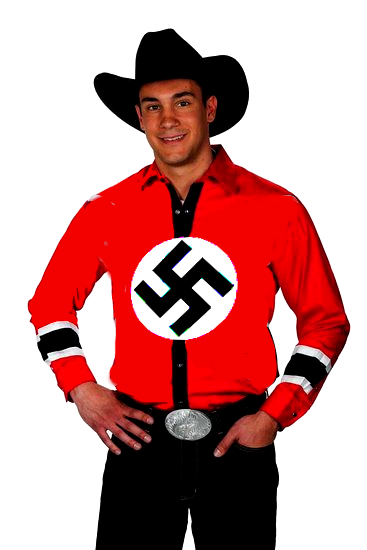 A lot of people enjoyed my photoshopped Nazi cowboy, and the parallel imaginary interviews I conducted between this man and his Confederate counterpart, in order to make the very obvious point that we talk about two different symbols quite differently despite similarities in their historical use. But one thing might not have come across. It might seem, by drawing the comparison between wearing a Confederate flag and a Nazi one, that I am implying the Confederate is dishonest. If someone wore a Nazi flag this way, we would think he was lying when he said he wasn’t a racist, so the Confederate must be lying and really be a racist. I don’t think that’s the case. I do believe that either of those people could be perfectly sincere in their ignorance of their chosen flag’s history. And in the case of the Confederate flag, I think this is very often the case. This point is important because many on the Left are attempting to argue that “Heritage not Hate” is a lie, that the flag is in fact a flag of hate, that the people who wear it are actually racists no matter what they say. I believe that’s both wrong and unproductive. I believe those who wear the flag are often sincere in their belief that it is about their heritage. I believe they are ignorant of the flag’s ignoble history, and that they fail to appreciate the monstrousness of the cause for which the flag has always stood. I believe they are not a gang of malicious racists, but an oblivious confederacy of dunces. This strikes me as crucial if the left, who oppose the use of the flag, are going to make progress. By automatically calling people who wear it racists, instead of recognizing that it is both the racist and the ill-informed who wear the flag, they give up a chance to educate many people who sincerely do not wish to be racist and think they are not. These people cannot understand the accusation that the flag symbolizes their hatred, because they do not actually feel hatred. The accusation rings false, because it is false. That is not why they are wearing the flag. They do feel a pride that is not linked to hatred. I think if we examine that pride carefully, we can see that it really is a kind of perverse white pride that is pernicious and linked to a legacy of barbarity. 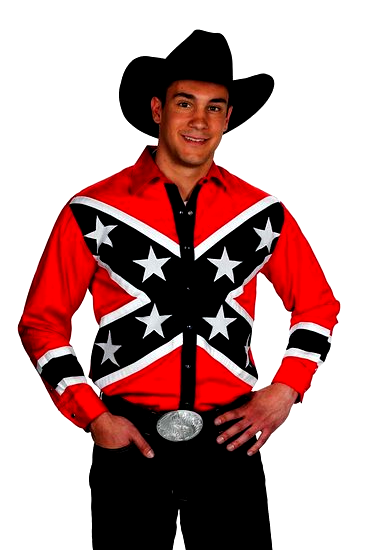 I think people who wear the flag without hatred, and honestly think it is about Southern pride, should ponder why black Southerners, equally fond of their home, don’t ever seem to wear the flag. But I do not think the Left is correct to say the flag is purely about hatred, when it is also about sincere, old-fashioned ignorance. Are you sure you think wearing that is a good idea? What would you say to people who think wearing that flag is “offensive” or “racist”? I’m not a racist, that’s not what this flag means to me. For me it’s about who I am and where I’m from. It’s nothing to do with race or anything like that. But doesn’t the flag have a history of being used by those with racist causes? Well, I can’t speak for them, I only know why I wear it myself, which is to show that I’m proud of my heritage. Plus there’s the massive racist violence, the millions of dead. Is that the heritage you mean? No, obviously not. I don’t endorse any of that. It’s not about that for me. 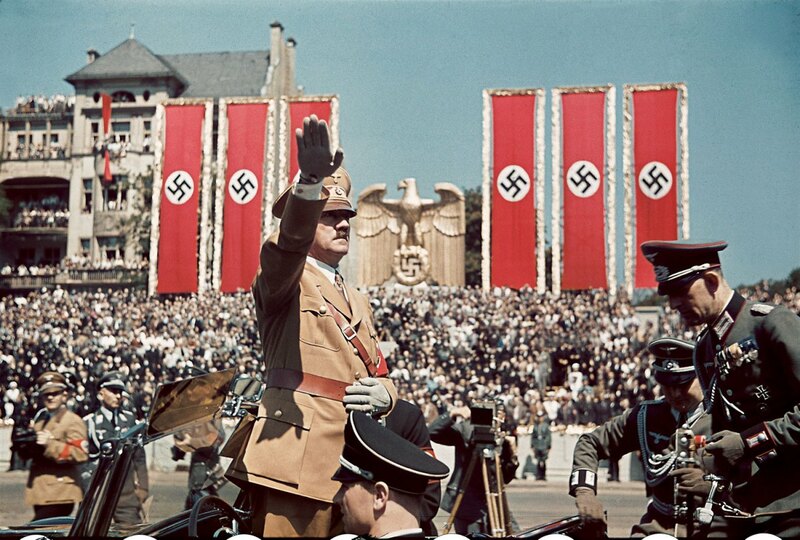 It just means rebellion, it’s that German spirit, it’s about celebrating our people. But what about the fact that it doesn’t even symbolize your people? It was an ancient symbol used by Hindus and was revived in the 1930’s as part of a fascist movement by white supremacist Nazis. You’re not listening. Today it means something different. 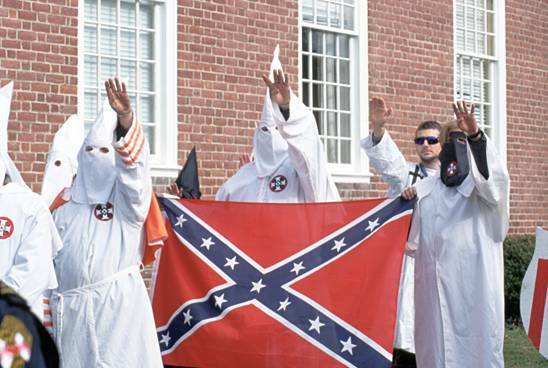 …do you ever think that maybe you might not want to be wearing the same flag as these people? I’m nothing like those people, the comparison is ridiculous. It doesn’t matter how they used it. That’s not how I mean it. If some are offended, it’s not my problem. There will always be some ignorant people who don’t understand what the flag really stands for. What would you say to people who think wearing that flag is “offensive” or “racist”? Plus there’s the massive racist violence, the millions of slaves. Is that the heritage you mean? No, obviously not. I don’t endorse any of that. It’s not about that for me. It just means rebellion, it’s that Southern spirit, it’s about celebrating our people. But what about the fact that it doesn’t even symbolize your people? It was hardly ever used until it was revived in the 1950’s as part of a segregationist movement by white supremacists and Klansmen. I’m nothing like those people, the comparison is ridiculous.It doesn’t matter how they used it. That’s not how I mean it. If some are offended, it’s not my problem. There will always be some ignorant people who don’t understand what the flag really stands for. I agree with your objections, aesthetic and otherwise, to the proposed Mary Poppins statue in Central Park…and I share your puzzlement as to why our enlightened and sophisticated parks commissioner should have okayed it. But why has no one raised the most obvious objection to commemorating this woman: that she was a domineering ignoramus who couldn’t, or at least wouldn’t, answer the simplest questions of her charges. Nor did she give them, as other semiliterate governesses of ten did, love and imaginative sympathy. For these qualities, Miss Poppins substitutes the densest, dreariest conventionality backed up by authoritarianism: “It’s right bdecause I say it’s right and button up your galoshes and come along at once!” Or words to that effect. When their perfectly reasonable questions became too pressing, she evades them by some silly trick like flying up into the air with her umbrella… They all fall for it, according to the book, and she establishes a charismatic dominance over her brood. But I wonder if the older ones didn’t realize she was merely changing the subject, like any other stuffy grownup… Years ago I used to read books to my children and I remember how bogus and somehow unpleasant that Mary Poppins stuff came out– none of us really liked Mary P. very much, for all the magic she used to conceal her lack of either knowledge of feeling–and how quickly we gave her up for the adventures of that free-and-easy savant, Dr. Doolittle, a real intellectual type who loved to explain everything and did so most satisfactorily and charmingly. If we must have another brazen child-trap in Central Park, let it be a statue of the civilized doctor rather than the troglodytic governess. -Dwight MacDonald, October 15, 1966, from Discriminations: Essays and Afterthoughts 1938-1974, p. 250-251.